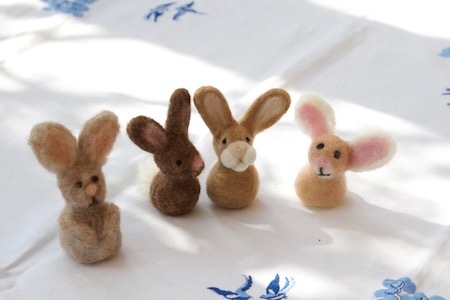 Now that you have practiced simple needle felted shapes, we will use them to create a cute little bunny. 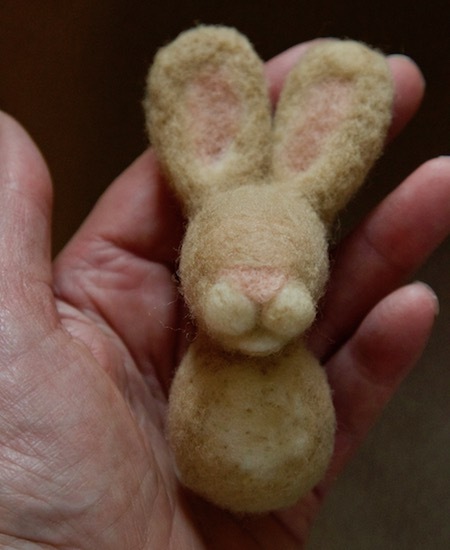 This tutorial also includes flat shapes for the ears and nose, along with instructions for covering the core wool with a top coat to add color to your sculpture. We will begin by adding the head to the body. 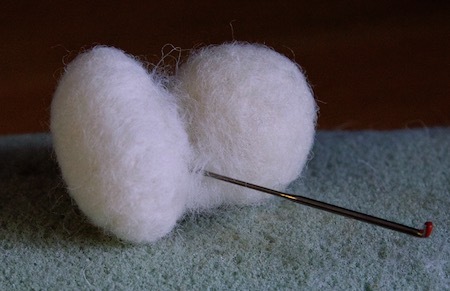 Take a wisp of core wool and stab the center of it a few times to the underneath of the egg. Position it nearer to one end than the other, so that the nose will stick out in front of the body and the back of the head will be in line with the back of the body. Taking your coarse needle, stab from the head right through to the body, and vice versa, multiple times to secure the two shapes together. 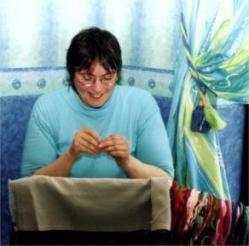 the photograph shows two needles to better explain the process, but you would only use one for this. 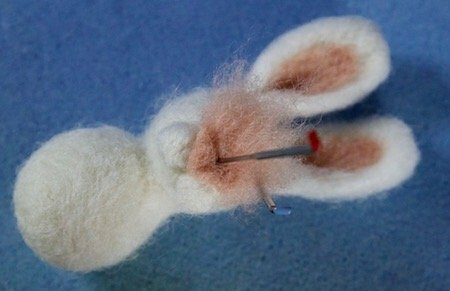 Work your way around the join, securing the "fluff" to both the head and body, forming a tidy neck for your needle felted bunny. 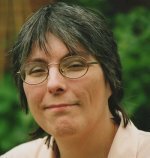 You are aiming to end up with a single shape, that cannot be separated when you attempt to gently pull the head from the body. 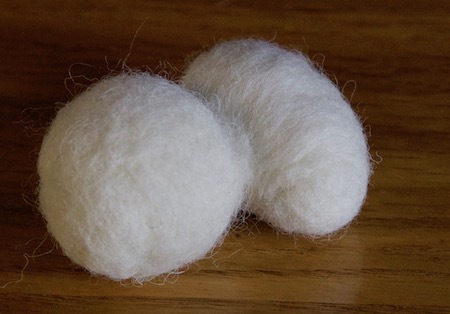 Take two similar sized and shaped pieces of core wool and lay them on your felted surface. This will help to ensure your ears are a similar size when finished. 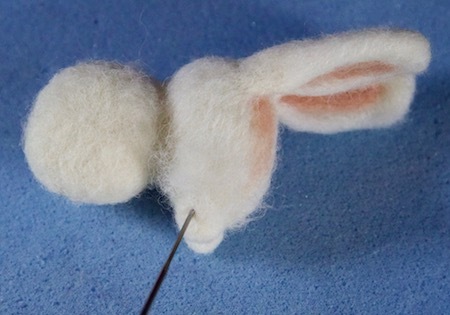 Use your needle to stab a rough shape of the ear into the wool on both pieces. Do not worry about outlining the bottom of the ears, we will leave those loose to help to attach them to the head later. 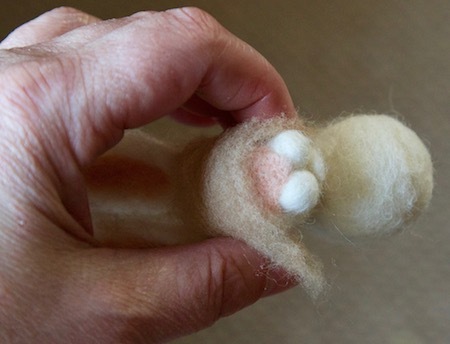 Using the side of your finger, gently roll or fold the fluffy edges of the ears over to the middle of the shape you outlined, starting with the top. Don't push too far or you will lift the ear off the foam. Stab the ears gently, trying to keep the needle at a 45 degree angle so as not to stab them too securely into the foam. 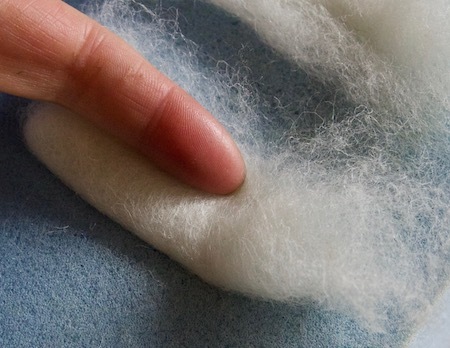 Once you have the loose fluff attached in place, gently ease the ears off the foam so they are not firmly attached. 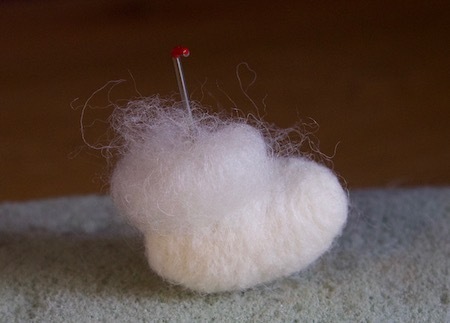 Then work on the back of the ear to continue felting. 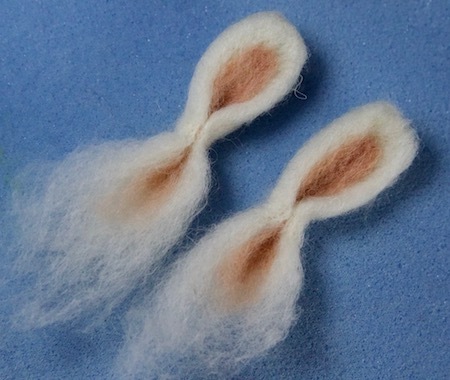 Taking wisps of pink or peach wool, add the colour to the inside of the ear, again using a 45 degree angle, to avoid pushing the colour right through to the back of the ear. 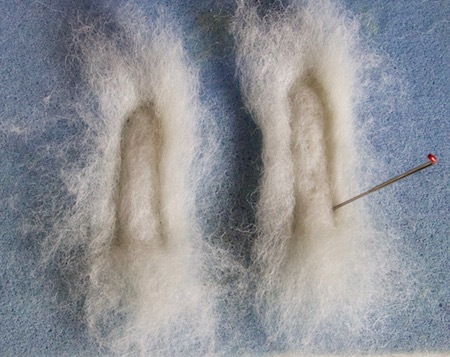 To complete your ears, pinch the bottom of the felted area together and secure with your needle, to give them some shape. 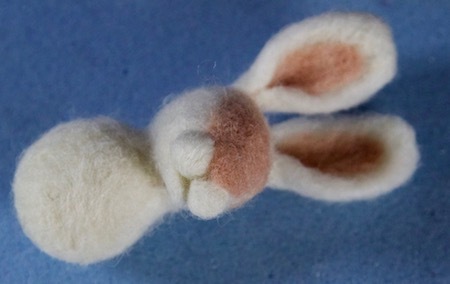 Take the fluffy part at the base of the ears and spread it out so it forms a sort of "skirt". Position your first ear on the side of the head and using your coarse needle stab the base into the head. Go right around the ear, close to the base, then using the finer needle attach the frilly skirt to the head and down over the neck onto the body if it goes that far. It will be covered with your fur color so don't worry if the inside ear color shows on the head. Attach the second ear in the same manner. Try not to have too much of the frill in between the two ears, instead push any loose fluff towards the front and back of the head. Take a small wisp of your inner ear color, and fold it into a tiny triangle for the nose. Gently stab it on your foam, before attaching it between the two cheeks, pointed end to the front of the muzzle, and the fuzzy end on the top of the nose. Again, don't worry about the colour showing on the head as it will be covered with "fur' soon. I also added a triangle of white under the cheeks for the lower jaw. This is optional. 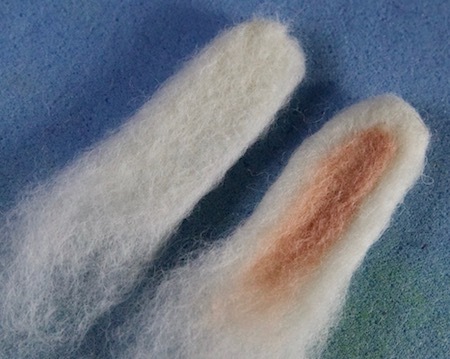 You can use short or long fiber wool for the top coat of your needle felted bunny. In the photographs I am using a batting of short fibers. Take a small piece and lay it over the white core wool. Using a fine needle, tack it down by taking gentle stabs all over. Don't push the needle in a long way, just use the notches at the very tip to avoid making big holes over the surface. Continue adding more fur to the bunny by slightly overlapping each piece until the entire body head and ears are covered with a thin layer. If there are any areas where the white shows through you can touch them up with an extra wisp of colored wool. I left the chest and muzzle cream on my rabbit. 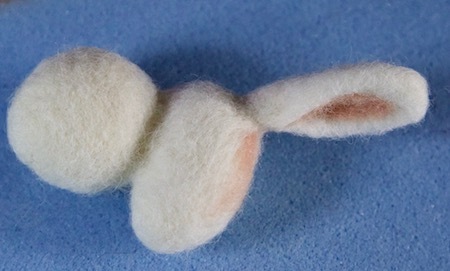 Needle felted animals can have various types of eyes. 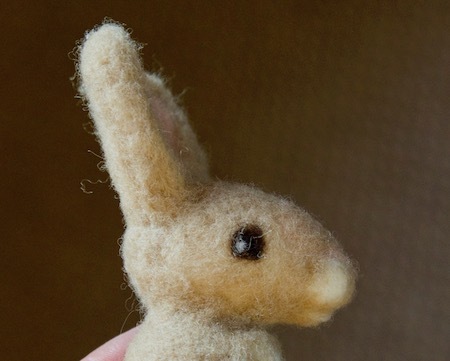 You can use tiny black beads, teddy bear eyes or make them out of wool. Dyed jet black wool can be a little harsh, so you may prefer to use a natural black (which is really a very dark brown). Take a tiny wisp and roll it into a ball between your palms. 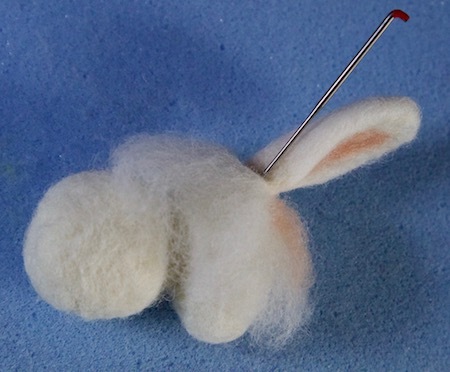 Create a second eye the same size before placing them in position on the sides of the rabbit's head. Using the fine needle, tack them in place with small pokes. If any fibers try to escape around the edges twist your needle around them to "coral" them into place. Add an even tinier wisp of white to create the highlight in the eyes. Attach the tail ball to the back of the bunny, as we have done before. 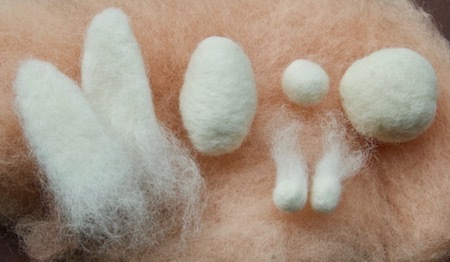 To create long fur on your tail you will need to use a fiber such as Merino. For mine I chose a Merino mixed with silk, which had a shiny appearance. 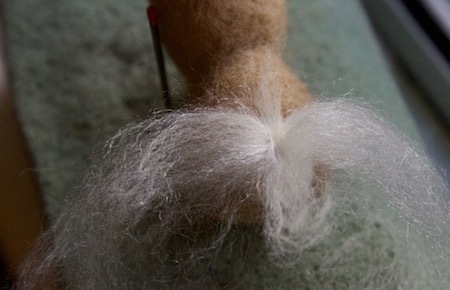 Pull a length of wool from the roving and lay it across the tail. Tack it down across the center, at right angles to the way the fibers are laying. To secure it even more take a few fibers and lay them at right angles and poke in the same place as before. Fold the ends of the attached fibers together so they stick straight up in the air. 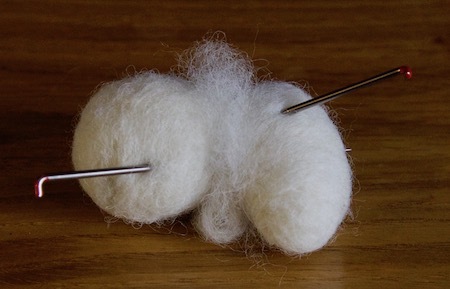 Work across the whole tail in this way, until you have covered the entire core wool. Take a pair of scissors and trim the fibers to the length required. 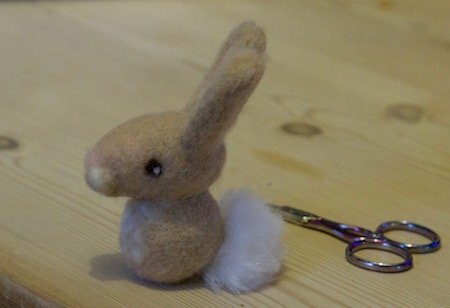 I taught this little needle felted bunny at a live workshop recently. Everyone's bunny turned out differently, but they were all super cute. If you try this tutorial yourself, I would love to see your results.